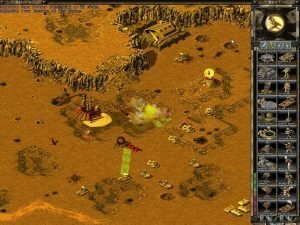 Few people are aware that you can still play Tiberian Sun online (mainly via GameRanger), and the competition online, as with the more popular Red Alert 2, is fierce. Most players are pros, and with good reason (they have been playing TS for two decades or so). Let’s immagine you’ve just started a game with such a player. Is there any hope of victory? As soon as you’re in, take whatever units you start with and send them off to scout as much of the map as you can early on; it’s worth sacrificing a few cheap units to get a view of the enemy base. 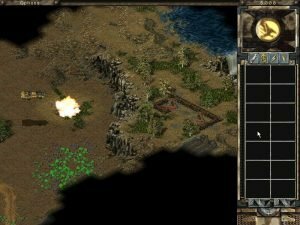 Build a barracks before you start the tiberium refinery. This allows you to supplement your scouting force early. Many of the maps in Tiberian Sun are huge, giving you time before the first attack. Don’t waste this time building vehicles that will just sit there for several minutes. Instead, use it to increase your income by getting more harvesters running. After your tiberium refinery is finished, build a war factory, and then immediately build another harvester. Once your basic buildings are up, build another tiberium refinery. In the long run, get six to eight harvesters running out of three or four refineries. The surest way to win a game is to outproduce the enemy. While managing your income, continue building your base. Here we find a new quirk: multiple factories do not decrease build time for units. This has serious implications in game play. There is no point in building more than one of any factory as long as you can defend that one. Also, if you have more than enough income to keep your war factory running full blast, build other aircraft or infantry to supplement your main force. Regarding base defense, don’t go overboard with stationary weapons. Defensive structures create more carnage for your credit than mobile units, but the player that has nothing but defense won’t win many games. The source of income is outside of the base, and it takes a lot of towers to protect a tiberium field. The weak link is the harvester. Since the harvester is where players are most vulnerable, attack it. If you can cut off your opponent’s income and protect your own, victory is only a matter of time. On a large map, build an air force or fast vehicles to do raids. Even if you lose two thousand credits’ worth of units to take one harvester out, it is worth it. While these strategies are great most of the time, Westwood throws us off with the “Harvester Truce” option, which renders our tiberium-mining friends invulnerable. With harvester hunting out, the focus of attack turns to the enemy base; this is where defense takes center stage. In a long game, play defensively, build a ton of harvesters and put together a force so large that the enemy base will seem like nothing but a glorified speed bump. Remember that this only works with invincible harvesters; in all other games, think offense first. Now let us move to proper attack strategies. First, remember to consider force composition. Don’t blindly build only Titans or airstrikes or a mob of cyborgs’ll destroy you. Watch what the enemy is building (you did scout her base early on, right?) and construct a force to counter it. If the enemy has many vehicles, build units with rockets or cannons. If infantry is the bulk of his force, machine guns and flamethrowers are more effective. Infantry make a great supplement to vehicles and they can be quite effective when used properly. GDI jump jet infantry and NOD cyborgs can avoid being run over by enemy tanks, a weakness that made ground troops in Red Alert practically useless. They are great for swarming defensive structures—they are cheap and powerful enough to easily overwhelm that pesky Obelisk of Light that keeps blowing up your vehicles. 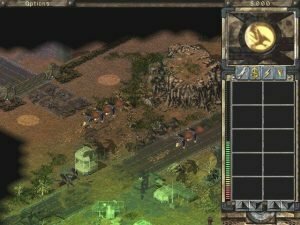 Probably the most notorious strategy in multiplayer Tiberian Sun is the dreaded engineer rush. With transports faster than speeding bullets and engineers that can take over buildings in a single bound, the easiest way to win a game is to capture the enemy construction yard and other key buildings. So fill an APC with engineers as soon as you can and send it to the enemy base. If you are playing NOD on a big map, move up the technology ladder quickly and send in a subterranean APC. Your main target should be the construction yard, but try to grab other key buildings, too. If you can get all of their tiberium refineries, the game is over. If not, go for the war factory. Another option when engineer rushing is to have a powerful defensive structure, such as the Obelisk of Light, already built when you attack. As soon as you capture a building, place the obelisk next door, and enjoy the show as it destroys the enemy base. Fortunately, there are ways to counter roving swarms of engineers. A few strategically placed vulcan cannons can save the game. To be safe, though, consider building a wall around your construction yard. The NOD laser fence is great for this; you only need four towers. Also, a couple of well-placed slabs of concrete to keep units from surfacing right next to key buildings is a good idea. Build a couple of engineers and have them stand near your construction yard. If an enemy captures it, immediately send your engineer in and reclaim it. The easiest way to stop an engineer rush is to see it coming. Keep an eye on what your opponent is building. If you see a NOD player with advanced buildings but few units, you can anticipate an engineer raid and prepare for it. The player making the rush is taking a big chance. If it fails, a lot of time and money was lost with no benefit. If you do defeat such a raid, put together a counterattack quickly; don’t give your opponent a chance to recoup the lost time. Now that we’ve covered general strategy, let’s take a look at NOD tactics. In a head to head battle, NOD is at a disadvantage. They have no counter to the Titan, the backbone of the GDI force. NOD players should try to avoid head-on battles with GDI enemies. Instead, use the speed and stealth of your units to attack and retreat. What NOD lacks in brute force is more than made up for with other technologies, so take advantage of them. You should move up the technology ladder quickly and stay away from early engagements. Once advanced units and buildings are available, a GDI opponent will have little chance. The underground units are devastating. Use them to pop up and pick off a harvester, then slip away. Also, cyborgs can be extremely powerful. Unlike other infantry, they can’t be run over by vehicles. If your opponent is building units that do not have good anti-infantry weapons fill a couple transports with cyborgs and attack their harvesters or a poorly defended building. At least one prominent NOD strategy has returned from original C&C. Build a wolfpack of five or more missile bikes, find a lone harvester cheerfully gathering tiberium, destroy it, and pull back. No ground unit in the game can catch these bikes, so an unwary opponent could easily lose a couple harvesters. Also, use the NOD artillery. This is easily the most improved unit. Its firepower can leave craters, slowing movement of units. If an attack force is on the way, crater its path and pummel it as it gets bogged in the rough terrain. As GDI you should seek a straight-ahead fight. In a battle of brute force, your units are simply more cost-effective than their NOD counterparts. If playing against NOD, build a sizeable force and carry the fight to the enemy. On some small maps, there is only one tiberium field near the enemy base. Send your units and lay seige, cutting off the enemy income. The majority of your force should be Titans, but be sure to have other units for anti-air support. A weakness for GDI is the lack of an effective anti-aircraft vehicle besides the MLRS, which is overpriced and under-armored. Also, be sure to build several mobile sensor arrays to warn you of underground units. In the end, the vast majority of games are won either by quick rushes or simple outproduction of the enemy. Keep your eyes set on this goal; the above strategies are merely means of achieving it. Now get out there and do your part to silence that annoying opponent.